If you do a lot of construction work, you rely on cordless drills. A lot. But even if you are not a professional, a cordless drill really comes in handy for doing minor work and small repairs around the home. I maintain that every home should have one. Now, as with anything else these days, there is a huge variety of cordless drills on the market, and choosing one can turn into a nightmare. However, I decided to take the easy way out with this review, and checked out the DEWALT DC970K-2 18-Volt Drill/Driver Kit. Not only is it the #1 Best Seller on Amazon, but it also boasts an impressive rating from users. The fact that it is the best-seller doesn’t automatically mean it’s good, but the Amazon rating had me thinking. Besides, DEWALT is known for making great power tools and I’m willing to bet their cordless drills are no exception. Let’s check it out. The DEWALT DC970K-2 boasts DEWALT’s characteristic yellow casing. Hidden underneath it is a powerful motor capable of handling most challenges. It can drill through most materials, such as wood, plastic and metal, as well as drywall. Depending on your needs, it has two speed modes to choose from: 0 to 450 or 0 to 1,500 rpm. 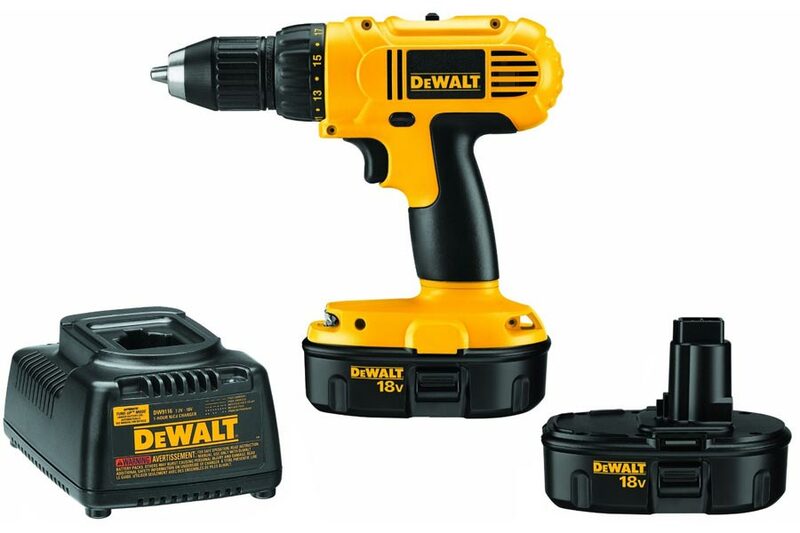 Even though this is DEWALT’s entry level power drill, the motor delivers an impressive 380 watts of power, thanks to an 18-volt nickel-cadmium (also called NiCd or NiCad batteries) battery. In fact, this drill comes with two batteries, which should ensure all-day operation without re-charging. Weighing just 5.2 pounds, the DEWALT DC970K-2 can be considered very light, and seeing as this drill is 9″ long, this figure is all the more impressive. They’ve kept the weight down with generous use of plastic for the casing, but the DEWALT DC970K-2 also uses a plastic chuck instead of a metal one. Of course, metal chucks are more durable, but that would add to the weight of this unit. Speaking of the chuck, the one inside the DEWALT DC970K-2 is a 1/2″ single-sleeve ratcheting chuck. Its keyless design allows simple switching between bits and fastening tips. If you are thinking of using the largest bits with this unit, they won’t fit, but all the other bits will fit just fine. I would not consider this a fault, however, because handling the largest bits is not something I would expect from an entry-level cordless drill. Obviously, the major advantage cordless drills have over their corded counterparts is the unlimited range of movement. Unfortunately, they are typically less powerful, and when the battery goes dead you have to wait for it to recharge, which is a drag. One way of circumventing this issue is to get another battery pack. The DEWALT DC970K-2 comes with two packs as standard, which is a major bonus, since it gives you the ability to carry on with your work without any interruption. If all-day operation is what you are aiming for, you will be happy to know the DEWALT DC970K-2 comes with a quick charger which is able to charge a single battery in an hour. But, remember, you won’t have to wait that long, because it also comes with two batteries. In essence, you always have one battery pack to rely on while the other is charging. The DEWALT DC970K-2 uses NiCd batteries, not the Lithium-Ion batteries that are far superior (they charge faster and their charge lasts a lot longer). However, because this drill comes with two battery packs, you won’t regret not getting a model which uses Li-Ion batteries. Also, NiCd have advantages of their own. They have a longer shelf life than Li-Ion packs, which sometimes only last 2 to 3 years before they need to be replaced. Another known drawback to Li-Ion batteries is that they tend to have problems in low temperatures, while NiCd batteries offer the same performance regardless of the outside temperature. As with any kind of combo tool, you gain some versatility with the DEWALT DC970K-2, but you lose out on some of the performance. If you plan on doing specialized work such as unscrewing old rusty screws, you might be better off with an impact driver. But if you need something versatile and powerful enough for most operations, the DEWALT DC970K-2 combo unit should be sufficient. DEWALT has great confidence in the quality of the products they put out, which is reflected in the extended warranty you get with pretty much every tool they make, including their cordless drills. You get a 90-day money back guarantee in case you are not satisfied with the drill, a one-year free service contract, plus a three-year limited warranty. Sounds like an infomercial, but you really do get all that. One thing that really stands out about the DEWALT DC970K-2 is its affordability, and it’s pretty difficult to find any faults with it. I suppose a metal chuck would be better than plastic, but then again, this is DEWALT’s entry-level unit. You get the drill, two battery backs, a quick charger and a carrying case, all for a price that sounds like a pretty sweet deal to me. I took some time to read through the user reviews on Amazon and elsewhere, and I was hard-pressed to find anything negative about it. This means the #1 Best Seller status is well-earned.